HONEY I SHRUNK THE SUPERBIKE WOPS ! Muck and Fun the Home our original people to first bring them to Ireland . Others sell Cheap Ones ours are still great value but come with CE approval - Spares back up guaranteed for LIFE ! Rossi Started out on these . WARNING : Our mini motos are not like any of the cheap rubbish being sold on Doedeal etc.. Our bikes for the price are as good as it gets out side of a full race €1k bike . They last - dont brake - offer great fun and blow the other donedeal sellers who offer home delivery and have no shop or back up out of the water. We cannot recomend ours more highly . This is a really a case of buyer beware with us you have back up guarnateed for life . XMAS SORTED - BIRTHDAY SORTED !! FOR KIDS AND ADULT WHO HAVE NOT + NEVER WILL GROW UP !! HONEY yes Son I SHRUNK Dads superbike !!! This is one of the best MT2A series bikes that you can buy and have been designed and built with the enthusiast in mind, with quality being checked at every stage of production. These are not the cheapest bikes on the market, but without question the quality is unsurpassed by any other mini moto pocket bike costing under €400.00. You really pay for waht you get and other suppliers in the cheap range we would not let in the door of our shop . Top speed depends on rider weight, but on average you should see 30-35 MPH with the bike in standard trim. At just inches from the ground it feels twice as fast! The 49cc engine we have is reliable, and with tuning modifications, power can be easily doubled, and speed substantial increased. The excellent geometry means the bike steers, turns in, and corners without fuss. Complimenting its sweet handling are the racing tyres, which work better than any other type tyre in either dry or damp conditions. To sum up this bike, you have the whole package: a reliable well engineered engine, a race-craft frame, race tyres, and painted fairings. Designed as a value for money starter bike for fun recreational use, or for those wanting to try mini moto racing for the first time. Both standard and performance parts to uprate this model, are for sale on this very website! Buy now and you could be riding this tomorrow. It's a great bike! SPECK BELOW Are you the next Rossi ! mproved body frame, stronger and lighter. Irelands biggest and best range bar none ! The Super Motard, is a cross between a mini moto race bike and a mini moto dirt bike. The bikes are designed for racing around on tarmac and flat ground, with the odd gentle off road section thrown in. The engine is a standard mini moto unit, 49cc in size, and within our performance parts we have dozens of modifications to sup up the power. In fact our high compression head kit doubles the standard factory power output! 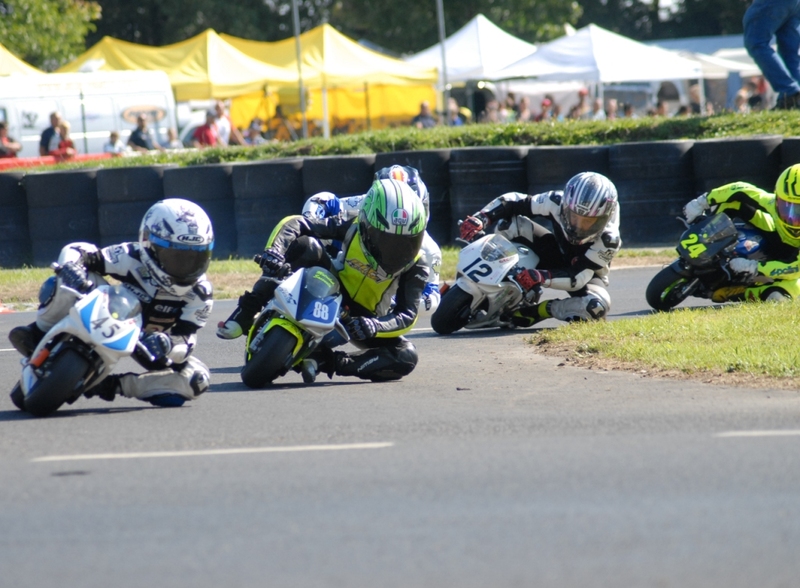 With mini moto racing now happening every weekend at dozens of karting circuits up and down the country, it's only a matter of time before the Motard has it 's own racing series. This muck and fun Mini Motard gives you high speed thrills with excitement and not forgetting the essential grin-factor. Despite the small size, it can be ridden by riders of all heights and can carry weight up to 15 stone! Warranty 30 days, engine parts only.